Latest News – Page 2 – Cableway No Way! The LNP’s Ray Stevens continues to treat the Mermaid Beach electorate with contempt in our Meet the Candidate radio interview today on the ABC Gold Coast’s Mornings program. 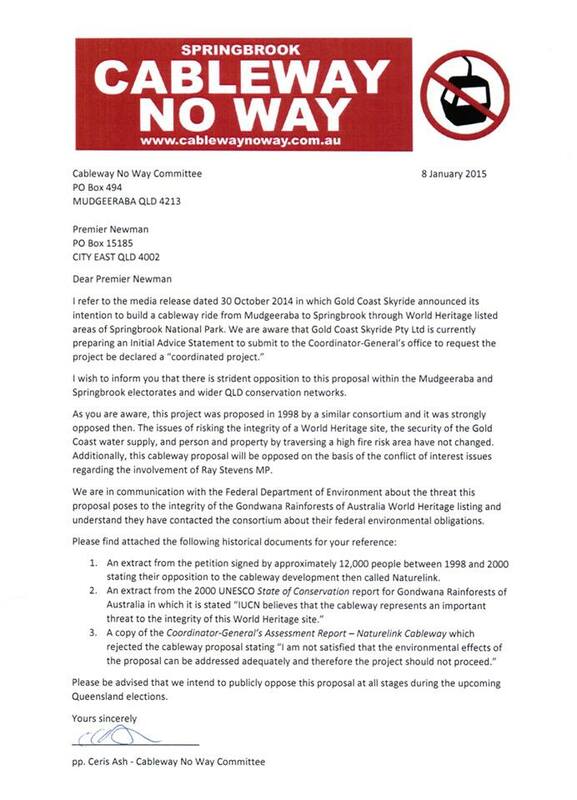 He still refuses to release the integrity commissioners report about his private development project into the Gold Coast’s World Heritage listed National Park in Springbrook. The proposed Springbrook cableway was rejected as being unviable and unsuitable 16 years ago. It was reported that the original failed project was intended to be sold off to overseas interests as soon as it was approved so that developers could make a quick buck. What’s stopping Ray Stevens doing the same if he is re-elected? Absolutely nothing. He isn’t interested in its viability, Gold Coast tourism, sustainability or whether it’s even appropriate for Springbrook. My stance as a vehement opponent to the development of this World Heritage listed site has not changed, nor has the stance of the majority of the Gold Coast community. This is sheer profiteering by Ray Stevens; an opportunistic grab, using his position as a minister in the state government to secure millions of dollars in profit for himself. This is on top of his obscene parliamentary salary of hundreds of thousands of dollars. Voters in Mermaid Beach are livid. He must be voted out. Click the link below to hear an excerpt from ABC Gold Coast Mornings program with Nicole Dyer where I call Ray Stevens’ integrity into question. The proposed cableway to Springbrook is not a proposal of the LNP Government and is at this stage an idea put forward by a private consortium. No formal application was made to the Government before the writs were issued and as we are now in caretaker mode any future application would be considered after the election. True. But that doesn’t stop a candidate from stating their position on a major issue in her electorate. Other candidates are telling us their position. It, like any other application will be considered in the usual way and rigorously assessed by the relevant Department. But Ms Bates says there isn’t an application? And how could it be considered in the “usual way”, when it is proposed through the middle of a world heritage area, on state owned land? I have already publicly stated that any eco-tourism proposal in the electorate of Mudgeeraba would have to stack up environmentally and economically. But, haven’t the very laws that would have helped protect Springbrook National Park been weakened to enable commercial development in national parks? I am in favour of responsible ecotourism in the hinterland and will do whatever I can to provide a boost for the community and businesses. Please tell us then if 800,000 people a year to a small, fragile National Park, in a high risk fire area, with no sewage system at the source of the Gold Coast’s water supply is responsible ecotourism – or even responsible development full stop? In a milestone for the Springbrook community we’ll see the Purlingbrook Falls suspension bridge completed shortly for all to enjoy and for visitors to explore. Haven’t there been some problems with finishing this infrastructure? Hasn’t all work stopped for some of the same reasons that make a cableway difficult? The Purlingbrook Circuit will also be completed shortly (weather dependant). In a high rainfall, high fire risk area, tracks close regularly – from landslide, tree fall and other natural events. How weather dependent is a cableway, and what actions will need to be taken to protect private infrastructure interests, at the expense of the park and its wildlife? In addition, we have spent $136,000 to reopen Warrie Circuit and Twin Falls Circuit. Whoops, Warrie Circuit is closed again! Working closely with Glenn TOZER for Mudgeeraba & Hinterland (Division 9), we have reopened and cleaned up many of the popular walking tracks in Springbrook to encourage eco- tourism. Horses, BMX bikes and large commercial infrastructure like cableways, in National Parks is not low impact ecotourism. The LNP Government is a strong team with a strong plan to boost tourism as one of the four pillars of the economy, but we need to ensure that we stay on track to secure a bright future. Is ‘on track’ the continued weakening of the laws that protect these areas? What is the strong plan for Springbrook? As Mudgeeraba’s strong local champion, I’m looking forward to working with locals to make Springbrook an even stronger community. Then work with us, be our strong local champion and assure us that this destructive proposal will never proceed in our world heritage listed Springbrook National Park, a jewel in your seat of Mudgeeraba. 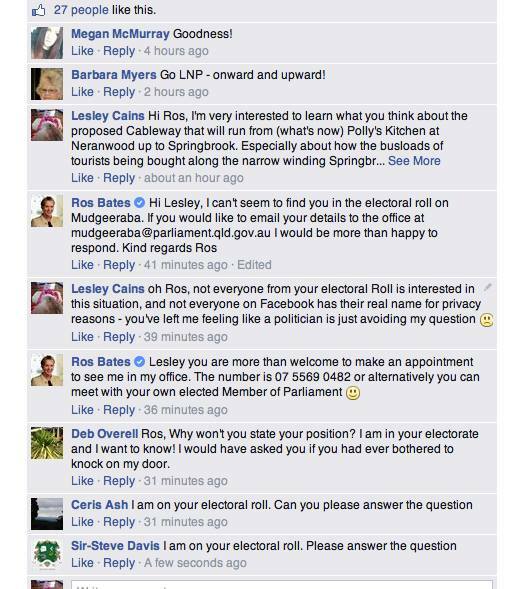 A few people have been trying to get an answer from LNP Member of Parliament for Mudgeeraba, Ros Bates, about her stance on the project. We are happy to show any politician’s position. [UPDATE]…especially when Ros Bates censors dissent by deleting the post and banning the dissenters. Fortunately it is now on record.